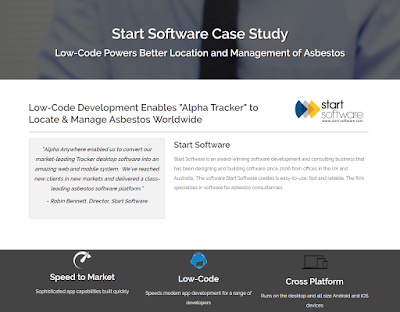 Our latest beta release of asbestos software Alpha Tracker is ready. We make beta releases so that we can trial new features ahead of the publicly available Alpha Tracker versions. This latest release is known as Release 27 Beta 4 and contains a number of new features and performance updates. 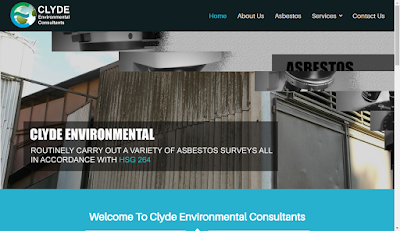 Our beta-test asbestos consultancy customers can contact our support desk to discuss the update. 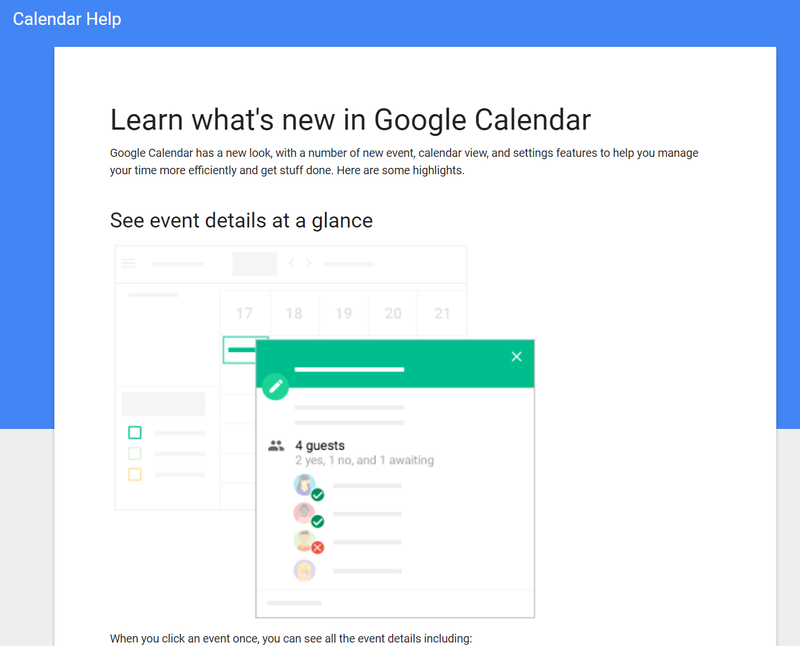 Google has updated their popular Calendar tool with a smart new look and loads of new features. Click here to read what's new - there is plenty! We've been working hard over the last few weeks to ensure that Alpha Tracker's built-in calendar and scheduling tool (used by asbestos consultancies to manage their on-site asbestos surveying, air monitoring and re-inspection work) remains fully compatible via our sync tool. 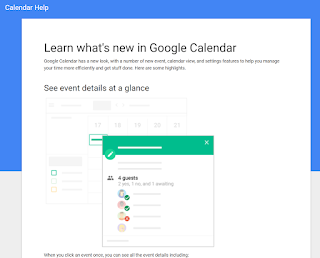 This means that asbestos surveyors can continue to view their work diaries on their smartphones, tablets or PCs directly in Google Calendar which is super-easy for them and means you don't have to email diaries around or use a scheduling whiteboard in the office. I happened across this story http://www.bbc.co.uk/news/technology-41969061 this week and had to really scratch my head and think - how did this design for the security within the system get past their internal quality controls? We take security very seriously in our applications. We regularly review security methods and look for flaws both internally and via external "penetration test" services. No system is 100% secure but it is our job to make our software as close to 100% as possible. 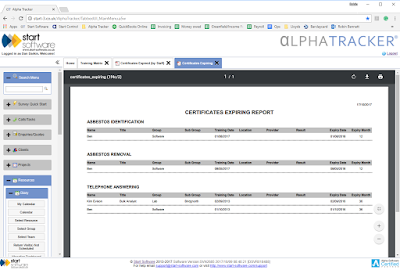 Our two web servers of choice (Alpha App Server and Microsoft IIS) are regularly patched and updated as security vulnerabilities are discovered. We do all we can to protect the data belonging to our clients and we put secure off-site backups in place on the servers we manage. Keeping systems secure is not easy and is a constant battle against hackers and other threats. We'll keep at it! 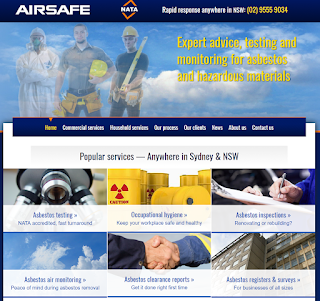 New South Wales based asbestos consultancy Airsafe has just switched to asbestos software Alpha Tracker. 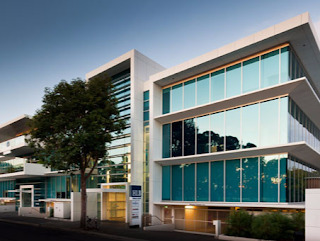 Airsafe are NATA accredited and pride themselves on their quick turnaround of asbestos reports for their clients. 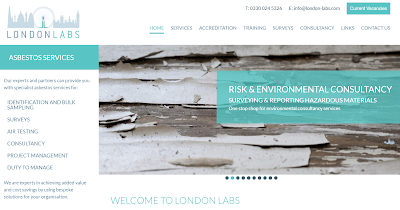 Airsafe offer the full range of asbestos testing services (including sample analysis, air monitoring, asbestos surveys and registers) and they will be using Alpha Tracker to improve their efficiency and client service even further. 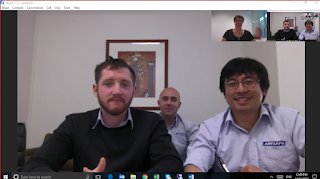 Judy trained the Airsafe staff via Skype from our Adelaide office - welcome on board! Please do call us if you are having problems and our advice, for time being, is to stay on iOS 10 if you can until all iOS 11 issues have been fixed. 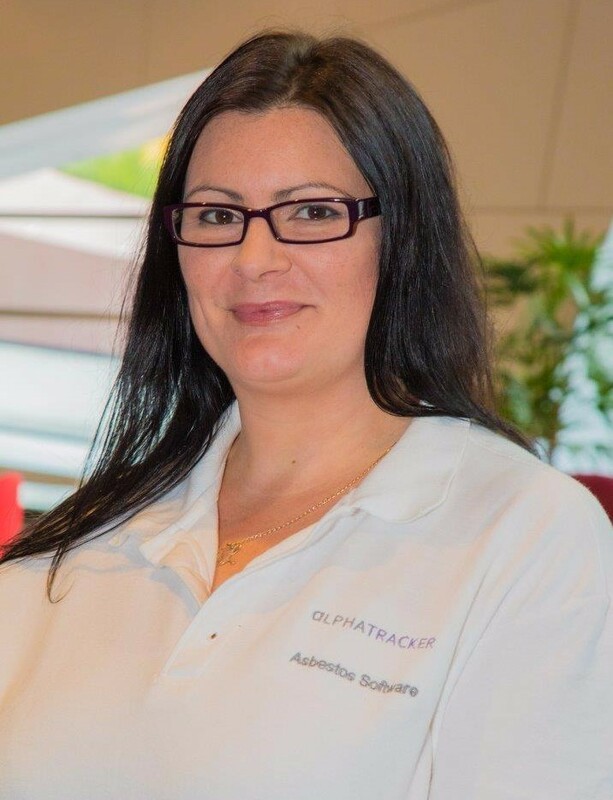 Our technical author Kim has been working hard to refresh our Alpha Tracker asbestos software manuals. 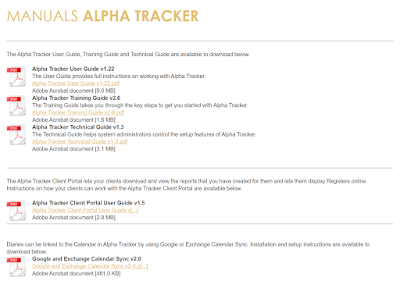 You can find updated manuals for Alpha Tracker here and do let us know if you want more documentation on any aspect of the system. 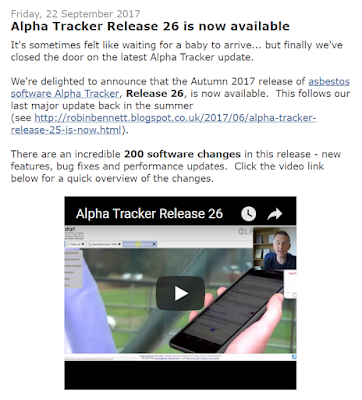 Most of our asbestos consultancy clients using Alpha Tracker have now updated to Release 26 (see http://robinbennett.blogspot.co.uk/2017/09/alpha-tracker-release-26-is-now.html and http://robinbennett.blogspot.co.uk/2017/10/alpha-tracker-release-26-performance.html). The feedback we've had is really good with lots of the new features being well received. If you need help to update your asbestos software system to the latest Alpha Tracker, do call or email the support desk - we're here to help. 25 years ago, I had a call from a friend of my Mum's, David Holloway. 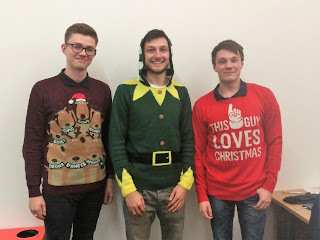 David explained that he was leaving teaching to start a business selling "Will writing software" and could I help him to create an easy-to-use system for solicitors and professional Will writers. I thought he was mad - who would want to buy that? - but 25 years later I'm still involved in the fascinating world of the Will-writer. I worked with David to create Will Writer for Windows, the first ever Will-writing product for the Windows operating system. Not all of our potential customers thought that Windows would "catch on" by the way... 25 years is a long time ago!! We used to sell it via classified ads in the back of computer magazines - "The only software to pay for itself time and again!". 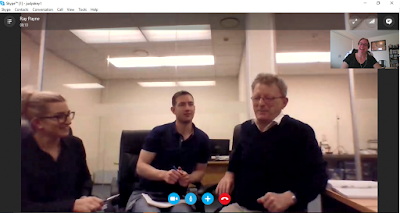 Will Writer for Windows sold well and so we started a business called Legacy Partners with one of our first software users, Arthur Galloway, selling Will-writer training and franchises across the country. 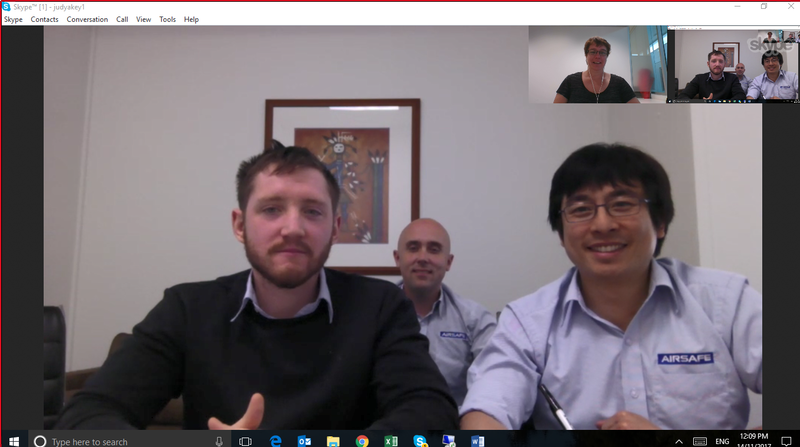 The franchisees received a laptop with Will Writer for Windows and software to manage their leads and clients, all with an automated back-end system to process orders and commission. The printing and binding of Wills was done from my new office in Bridgnorth with our baby son Connor in a carrycot under the desk. You could almost guarantee that he would cry when the phone rang from a Will-writer with a query! One of our first Legacy Partner trainees was an ex-mining engineer called Clive Ponder. Clive instantly stood out as being incredibly capable and determined to build a successful business. 17 or so years later and Clive's Countrywide Will and Trust businesses are the biggest in the UK and we are proud to be writing Will and office administration software for him still. The final chapter (for now!) of this story is the book in the photo. Clive introduced me to Matthew Mitchell, a dynamic and talented financial-advisor-turned-estate-planner who is also building significant businesses in Will writing and estate planning under the Legacy Legal brand. 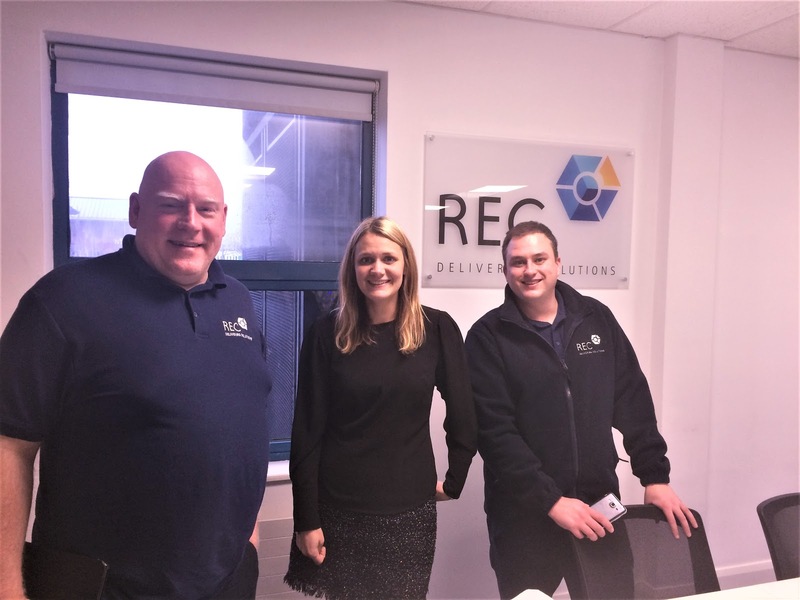 We're now working with Matthew and his colleagues to create systems and software to help him to work alongside Countrywide and attract consultants to join him. It's a been a truly enthralling story, enabling me to meet some fascinating people along the way. 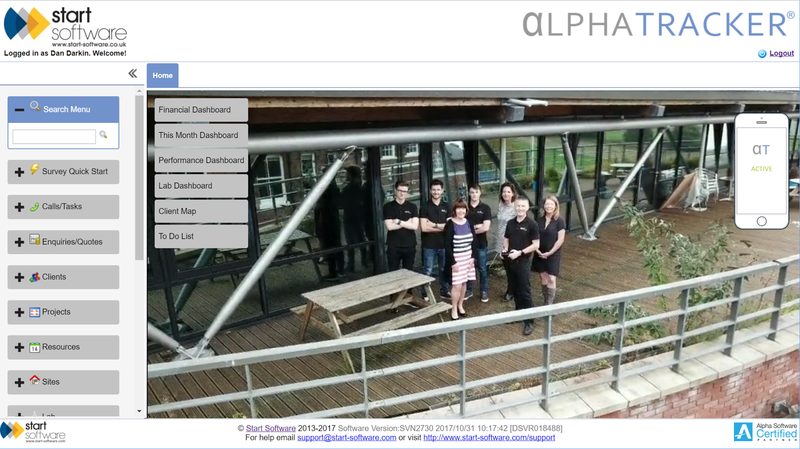 From the earliest Windows development tools (Borland Objectvision and Microsoft Visual Basic) through to 2017's most sophisticated web & mobile software builder - Alpha Anywhere - the journey has kept me interested for 25 years. Do buy Matthew's book by the way (it has a forward from Clive) - it's one of the best introductions to estate planning you can read. 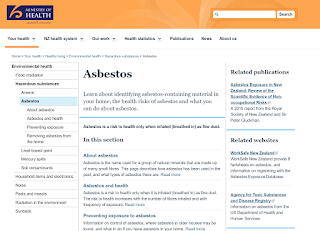 Reminder - our asbestos site data capture app runs on Android, Apple AND Windows! 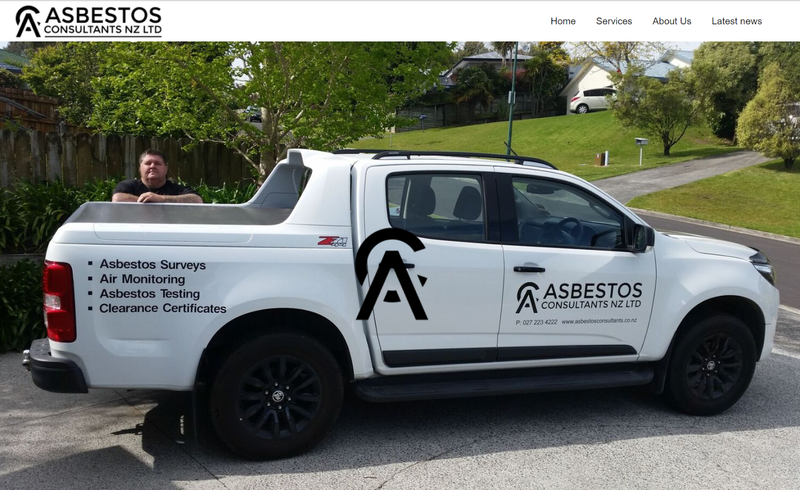 Just a reminder... our asbestos data capture app, Tracker Mobile, runs on anything!! You choose your data collection device - Tracker Mobile will run on it! 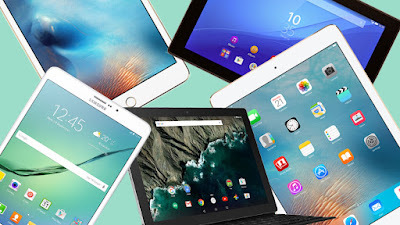 ... Windows 7, 8 & 10 tablets too (Intel). Tracker Mobile is part of the Tracker & Alpha Tracker family of asbestos software systems which support professional asbestos consultancies in the UK, New Zealand & Australia to improve and automate their businesses. Tracker Mobile does not need an Internet connection of any type while you are surveying. It only needs a connection at the end of the day when you press one button to upload all data, photos and plans from site. Do get in touch to find out more, we'd love to hear from you. 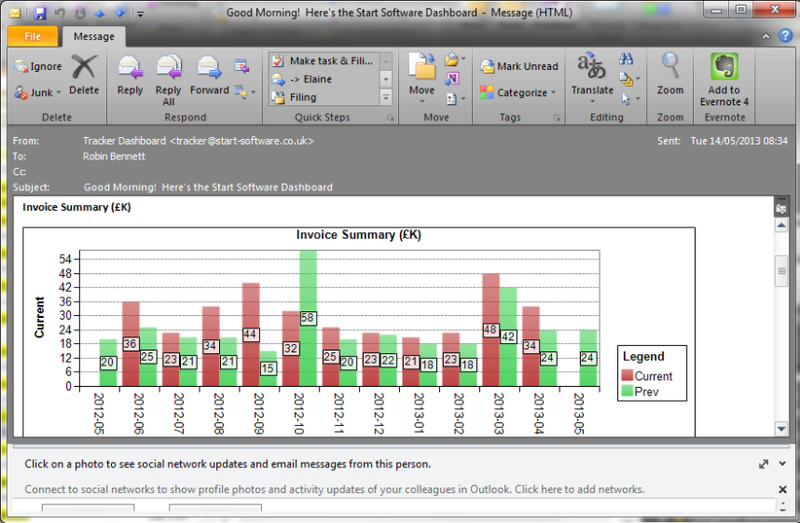 Our latest update to Tracker Dashboard is available to download and install. 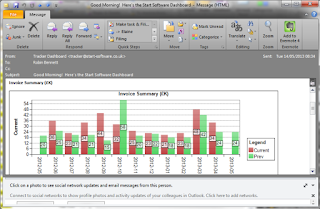 Tracker Dashboard is part of the Tracker & Alpha Tracker family of asbestos software systems and is used to send automated reports, charts and alerts to system users. This version, known as v1.0.287 SVN66, has improved dashboard queueing and - in particular - copes better with long-running dashboards. Please contact support if you would like more information or help to install the update. We've reviewed the support stats for October and we've had another good month with 9 out of every 10 queries resolved within 4 hours. 93% of urgent problems solved within 2 hours.